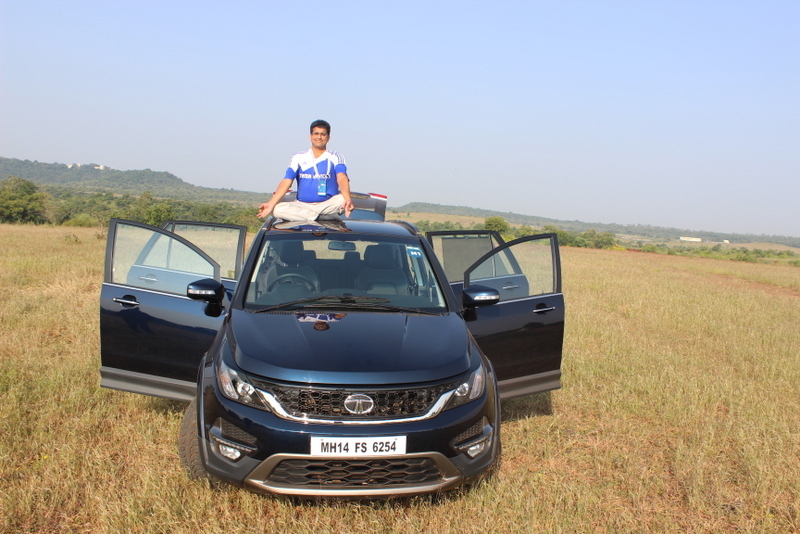 This post is my review of Tata Hexa, with which we spent last weekend in Hyderabad. This post focuses purely on the SUV while I have already published focused posts covering the Indiblogger HexaExperience event, Hexa’s Off Road abilities, difference between Hexa Automatic and Manualtransmission and how Hexa fares compared to its rivals- Innova and XUV500. 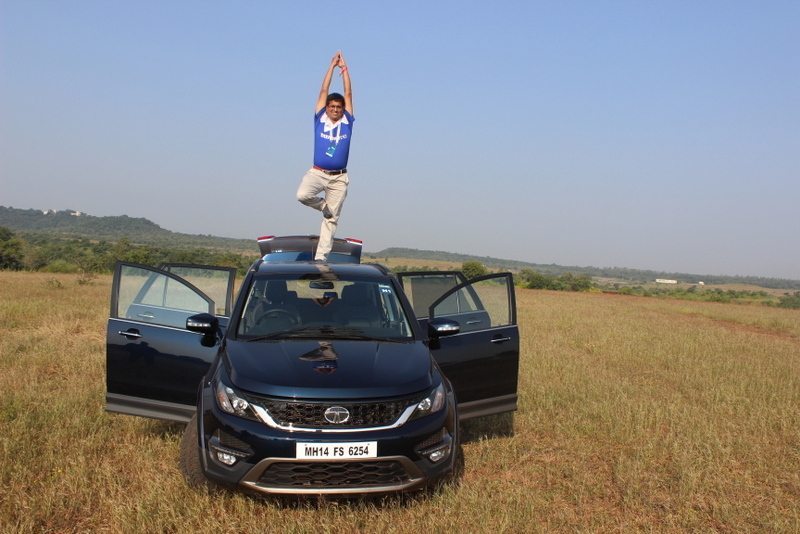 Before we jump into the specifications and review of the Hexa, it helps to understand the thought process that has gone into the development of this vehicle. 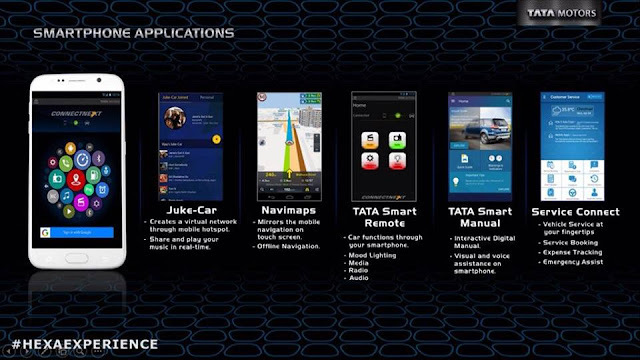 These were explained to us by Tata Motors core team during the presentation session. Below I am listing the key essence from that session, to help you get the context. Hexa is targeted at buyers of premium lifestyle vehicles- customers who need space, power and a respect commanding vehicle- customers who care for the value offered by the vehicle and not just stuck with the typical mentality of mileage and cost. The potential customers of Tata Hexa would be natural leaders- who care for their community, country and exhibit leadership qualities when situation demands. Hexa is designed for such buyers who need their cars to mirror their personality, lifestyle and leadership. Built on top the popular X2 platform (on which Safari Storme is built), Hexa is not an Aria facelift, but a completely new design. The shape has some resemblance but that’s where the similarities end. The dashboard, transmission, interiors are all new in Hexa. Tata’s design teams in Italy, UK and India have collaborated to finalize Hexa’s design. Tata has worked with manufacturers all around the world for high quality components that go into Hexa. With the IMPACT design language, the USP of Hexa is to offer a power packed, feature loaded and adrenaline pumped SUV. The Hexa has been rolled out in a short span of 2 years- from concept to roll out, which is a great feat. (May be having Aria as reference would have helped). Hexa was showcased in Auto Expo 2016 and Geneva motorshow 2015 and has received critical acclaim. After a massive road testing adding up to 8 lakh kms across 3 different continents, Hexa is now ready for launch. Bookings would open in November and deliveries to begin in January 2017. Lionel Messi continues to be Tata Motors brand ambassador, though his visuals were not used during the presentation. Hexa gets Tata’s signature smiley face. A massive 19 inch wheels are impressive (for your reference, Safari and Aria gets 16”, Innova – 16”, XUV 17”) and aid in its tall stance. Top end XT version will get projector head lamps, DRLs and fog lamps. The Chrome on the front facia is called Humanity Line. DRLs seem like an afterthought and not inherent to headlight assembly. Side profile is pretty standard to other cars in its class. No aggressive curves like the XUV, C pillar gets a twist and a Hexa badging is nicely positioned. On one side you will see engine badge and on the other, it will be 4x4 badge, if applicable. A black lining of cladding helps reduce maintenance cost,as this part wll absorb any scratches that may occur in case vehicle scrubs against anything- say a rock or such objects. On the rear, dual exhausts and horizontal tail lamp assembly come in the centre of the view. Aria’s vertical tail lamp has been abandoned for horizontal ones, which fits well into a Chrome strip. Hexa logo and variant badge is included. The Tata Hexa has been designed for people who love driving-Driver seat gets 8 way adjustments- forward, backward, top, bottom, recline angle and lumbar support. Unfortunately all adjustments are manual (competitors offer electrical adjustments). Seating position is good, offering commanding view of the road ahead. Steering gets only tilt adjustment, not telescopic as in competition- but when I raised this question I was told telescopic adjustment is hardly needed for big vehicles- it is highly useful in cars where you sit at an angle, in a low seating position. For my height I didn’t feel the need for telescopic adjustment- most average males won’t need it. If one is too tall telescopic adjustment is useful. For someone too small, outside view will be poor anyway, telescopic adjustment doesn’t help. Steering wheel gets the standard buttons- cruise control, call receive/reject and switches to change music and voice command. In Tiago, AC vent covers can be changed to get a customized feel. Such an option is not offered in Hexa, as it is a premium vehicle and customers are unlikely to worry about coloured AC vents. We talked to Mr Anand Kulkarni about the A pillar- if there is a way to get rid of it. I was told it is increasingly becoming important safety aspect- to ensure that roof doesn't come crushing when the vehicle rolls over. So next time you complain about this piece blocking your view, understand that it is there for a purpose. There is no key-less entry or push button start. Doesn't really matter- Cars with push button start usually require that you need to actually put extra effort like pressing the brake etc(for safety) before the engine can start. The instrument cluster is pretty informative- gets speedometer on the right (analogue) and tachometer on the left, with a colourful multi information display in the centre. It shows a colourful arc representing fuel level, indicates which gear and the the car is in, current time, outside temperature, trip meter and distance to empty. Door Ajar warning shows which exact door is not locked. Various error messages are also shown in this space. Red colour in below mode represents Dynamic mode. Auto gets white, Rough Road gets yellow and Comfort mode gets blue colour. Front passenger gets a chilled glovebox, which is cool. Passenger airbag can be turned off. Hexa gets a total of 6 airbags, while there is provision for 2 more. (Tip: just seeing a lid with airbag written on it doesn’t mean there is airbag inside-it could just be a provision- check with salesman to be sure the variant has airbags as supposed to be). Aria had a series of overhead spaces from front to rear- that has been done away with and the Hexa’s ceiling is pretty clean. Hexa still offers 27 utility spaces all around. I asked why a sunroof is not considered- I was told that it is not suitable for India and constitutes a very small market. However, sunroof can be added to your Hexa aftermarket as an optional accessory if you are serious about it. Second row can be bucket seat in 6 seat configuration or bench seat in case of 7 seat configuration. Folding these seats takes a bit more effort compared to Innova, where it is one push folding. There are enough charging points, AC vents and speakers in second and third rows to comfort these passengers at par with first row. I didn’t find too much time in passenger seats, but my team mates Indrani and Bhushavali who sat there felt it is pretty comfortable enough. The sun-blinds on the windows reminded me of the BMW 320 where I had seen same feature last. Luggage space behind the 3rd row with all 3 seats upright is decent- much more than XUV5OO or Innvoa. Folding 2nd and 3rd row will get you massive 671 litres of space. One of the characteristics of an SUV for me is that it should have a strong footrest and a skyrack, so that I can stand on its side holding the skyrack and my legs on the footrest. Hexa gets a skyrack but a smaller one (you can’t put your fingers under it . Foot rest doesn't seem standard, but needs to be added aftermarket. Mood lighting is a cool feature to lift your spirits after a tough day or create a party ambiance inside the vehicle. Expected only in top-end XT and can be controlled via touch screen interface or the app. The computer decides the engine response. Usually the right balance between power and fuel economy is achieved in this. -The sporty mode where engine tries to maintain high revvs and respond quicker to throttle. -If you are not an experienced driver, avoid using this mode, particularly in risky condition like highway high speed driving- as vehicle assumes you know what you are doing and safety features like ESP will NOT kick-in as early as it would have in say Auto Mode. They will intervene late only if felt really necessary. The 4x4 mode- The torque on demand system kicks in to supply power to all four wheels- or any wheel that has traction and help the vehicle navigate tricky patches. 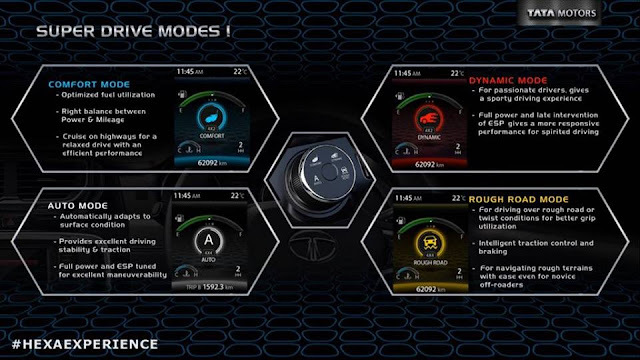 On the auto these modes are missed, but a Race Car mode gives the equivalent of Dynamic Mode. 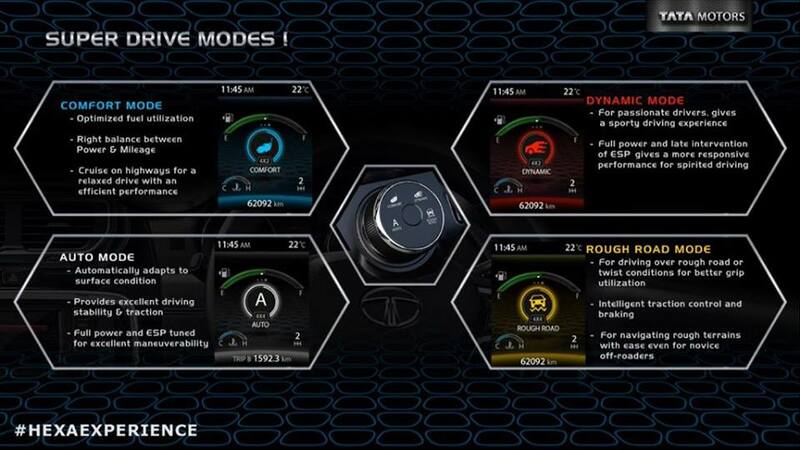 AT won't have 4x4 option, so rough road mode is not applicable. Check my post for all key differences between Manual and Auto transmission in Hexa and Hexa's abilities driving off-road. Hexa has longer wheel base, more overall length and width compared to its competition. This makes it more spacious for sure, but the turning radius is more and power to weight ratio is less. Hexa's 0 to 100 numbers are also a second slower on paper, but this makes no practical difference. During our drive we found the Hexa extremely easy and fun to drive- on the highways as well as two lane or rough roads. Hardly any engine noise creeps into cabin- the insulation is great. Hexa gets a top speed of about 178-180 kmph, more than enough. Fuel economy numbers are not announced yet. Hexa's stability and steering response is confidence inspiring, despite its size. A zig-zag drive or sharp turns or a quick overtake is not a concern with Hexa. Reverse camera with projected path is nice. What's extra and unique in Hexa is a push button reverse view. Without having to put the car in reverse or having to turn your head to check, just pressing a button will turn on the reverse camera, for quick view as to what's there on the back. There are auto headlamps, follow me home lamp (stays on for a few seconds even after Hexa is locked, to let you get inside home), 7 speed rain sensing wipers, climate control and more. While you may be enjoying the drive, rest of the passengers tend to get bored within few minutes into a road-trip. Thus having proper entertainment options is paramount in a lifestyle vehicle. Hexa gets a host of Apps for the convenience along with a ConnectNext Infotainment System. A 5 inch touch screen, 10 speaker JBL speaker system complete with 4 door speakers, 4 tweeters, a sub woofer and a power amplifier for theatre like sound effect. All standard connectivity modes supported. No More thick ownership manals. Use this app for reading about your Hexa's features and functions, to Book a service or view service details. XUV app gives you tyre pressures of all 4 wheels and the spare wheel, which I find very useful. Not sure if same is available in Hexa's App. Also, for navigation we had to keep the smartphone connected to the car via USB- if disconnected navigation will stop-this isn't an exciting proposition as we will have to disconnect phone several times during a road-trip. Not known at this moment, will be announced only in January 2017. The Aria had its cheapest variant at 9.95 lakhs ex showroom Delhi and most expensive variant at around 16.5 lakhs ex-showroom. Keeping in line, Hexa may also be priced between 10 to 17 lakhs ex-showroom, with on road price for most expensive trim coming close to 20 lakhs. Sales and After-Sales service: Tata Motors has trained 500+ salesmen on the new Hexa, so that they can assist the prospective customers better. Hexa will be available in about 250+ dealerships across the country to begin with. Bookings will open next week (November 2016) and deliveries are planned for Jan 2017 onwards. Commercial launch will happen in Jan when we will know the pricing. If you have noticed, most Tata Showrooms have undergone major revamp in recent times to give much better customer experience. In terms of service, we were told there is a plan to dedicate one service bay exclusively for Hexa. Hexa micro site also aims to provide maximum information and experience to the customer while he is in 'research phase'. Wonderfully detailed and informative post! Thank you! You'r welcome. Thanks for the good words sir. Very detailed review and you have touched upon a lot of points which were overlooked by others. I have query in the section explaining the different modes you said that in Auto mode 4x4 will not engage automatically, but I think the contrary to this is true. Am I right? Loved your attention to detail. Great post. @Damo- Yes, that is what the guy who took us on off-road told us. But I read in this Topgear report that Auto mode will also engage 4x4. So for now I will remove that line, let us assume Topgear is right. Thanks for your comment. Very nice review- the write-up on positioning bit at the start was very informative and refreshing. Does Hexa comes with static bending lights like the XUV 500?